I always start my trip reports with Day 0, since we stay at an airport hotel the night before we travel, and it marks the beginning of our holiday. This year, on the photo taking front for this day, I was very lax. Mainly because I was tired, stressed, and just couldn’t be bothered. And also, because we’ve stayed at the Premier Inn at Gatwick North before, I could always just include those pictures if I wanted to, as they place hasn’t changed since the last time we stayed. In fact, I will include a couple of those old pictures, since I am a visual person and need to know what things look like! Anyway, day 0 for us was a Thursday. Liam went off to college and Steve went off to work. Both were finishing around 4:30, and dad wasn’t picking us up until after 6:00 to drive us to the airport. I had a full day to busy myself. It started, as always, with trying to get our cat, Pumpkin, into her basket and taking her to the cattery. My brother-in-law helped me with this task, as Pumpkin hates me with a passion! After a lot of chasing about, we managed to get the cat into the basket, and I drove the 10 minute journey to drop her off at her holiday home for the next few weeks. I then came home, finished off some work, and watched the minutes and hours tick by until we could go on holiday! I also packed my cabin bag, since I had received one to review on my blog. I carefully curated all the things I usually take, but future me tells you that I still take way too stuff. 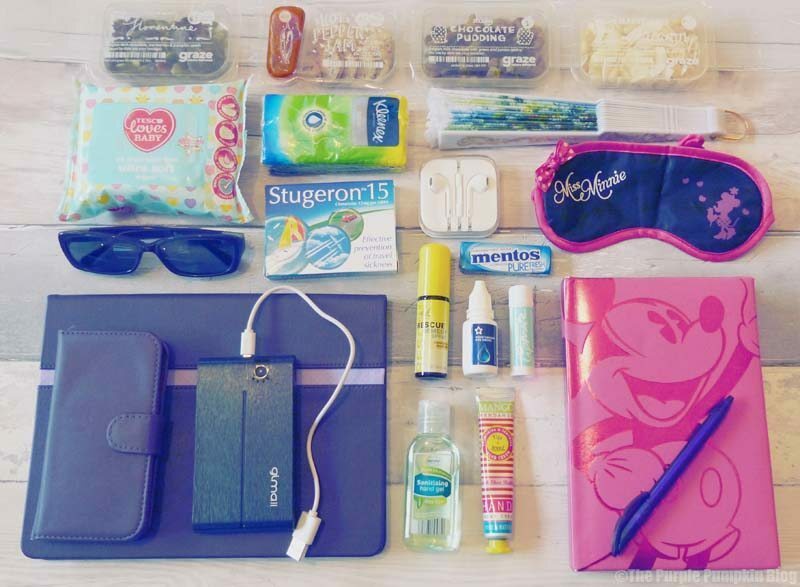 Next year, I’m literally taking my sunglasses (prescription) travel sickness pills, Rescue Remedy, phone, and chewing gum. It’s amazing how you take things you think you need, when actually, you don’t. I didn’t touch my iPad once on the plane! Neither did I write in my notebook, nor did I use the wipes, tissues, or other gumpf. I didn’t even use the fan when we got to Orlando until the next day. I can’t remember what time we set off, but it was a lot later than previous years, and it was weird to be driving to the airport in the dark. The drive was traffic-free (I think owing to the later time) and dad was soon dropping us off at the Gatwick North Terminal. He reminded us not to bring too many extra suitcases back with us – bwahahahahah, yeah right – and wished us a happy and safe holiday. Instead of checking into the Premier Inn, we went straight into the airport to do twilight check-in with British Airways. 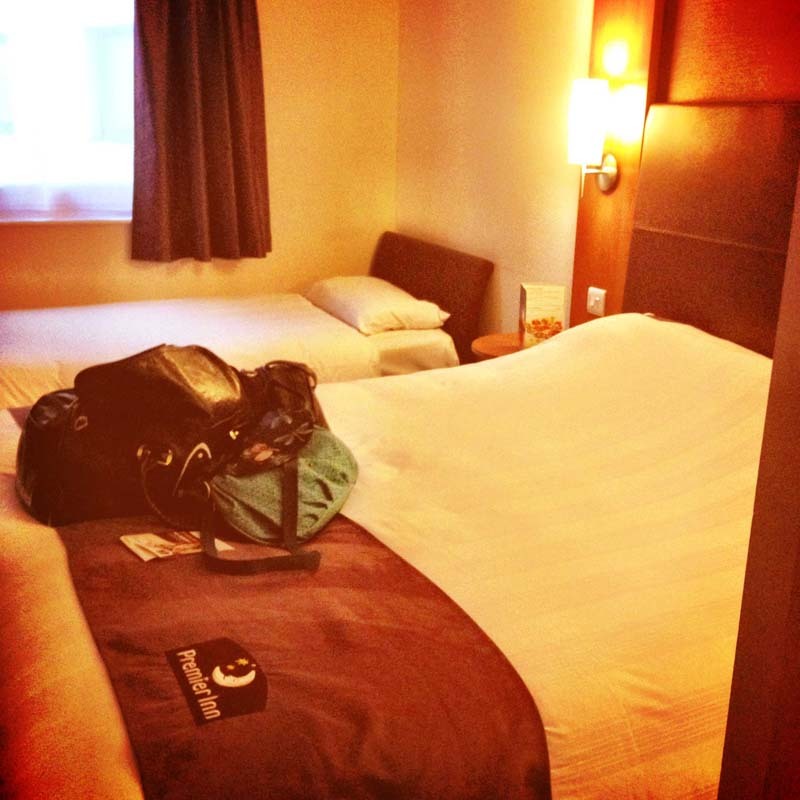 The last time we flew BA from Gatwick, and stayed at the Premier Inn, we stupidly dragged our cases all the way to our room first, and then dragged them all the way back to the airport. We learned our lesson after that! The check-in machines were not working properly for us, so we had to do things the old fashioned way and do everything at the BA desk. The airport was quiet, and there was no line at all. 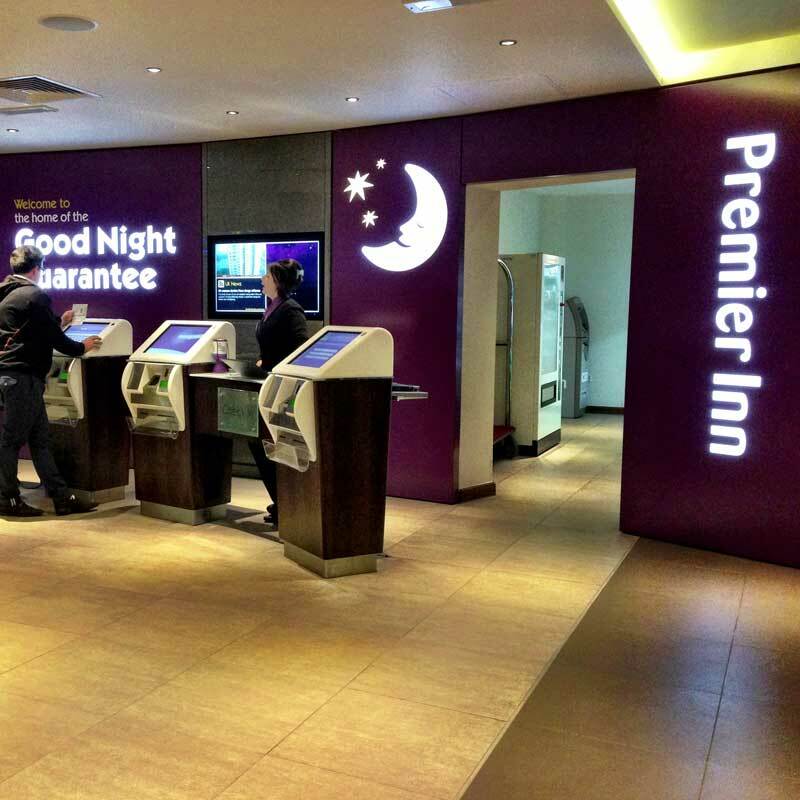 We waved goodbye to our luggage as it trudged along the conveyor belt, and returned to the Premier Inn. Before heading to our room, we thought it best to go and book at table at the Thyme Restaurant, as we’d forgotten to do one in advance. The restaurant was rammed, and we’d have to wait an hour. It meant we ate dinner rather late (around 9pm), but since our flight wasn’t till late morning, and we’d already done the checking-in, we were not too worried. The hotel lobby was also very busy, so we decided to go to our room for the hour… furthest one you can possibly get from the elevator, which always happens to use no matter where we stay. The hostess on the restaurant floor really looked like she couldn’t be bothered. In fact we stood waiting for a good 5 minutes before she even turned around from organising menus to acknowledge us. I’m a stickler for good service, even more so, I think, because I grew up in the catering industry. I somehow notice every little thing that should/shouldn’t be done. Eventually we were seated, not in the main restaurant, but just outside it, as there were no available tables. We waited a good 10 minutes for a server to come and take our drinks order, which disgruntled us even further, and made quick decisions for dinner, as didn’t want to be kept waiting any longer. I know when we booked the hotel, we did some sort of offer that meant Steve and I got our dinner included, but Liam couldn’t because he was classed as a child. So we paid for his separately. 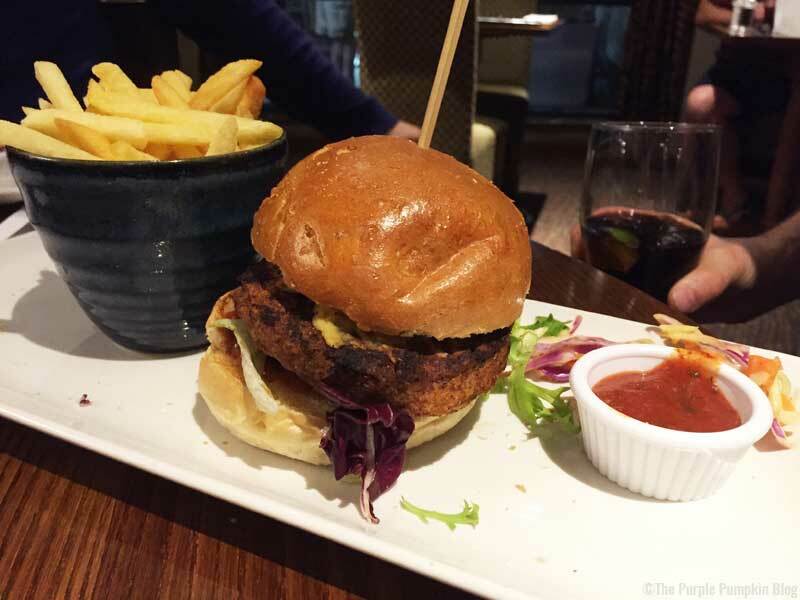 We all had a burger from the special menu for the Rugby World Cup, and shared a starter. 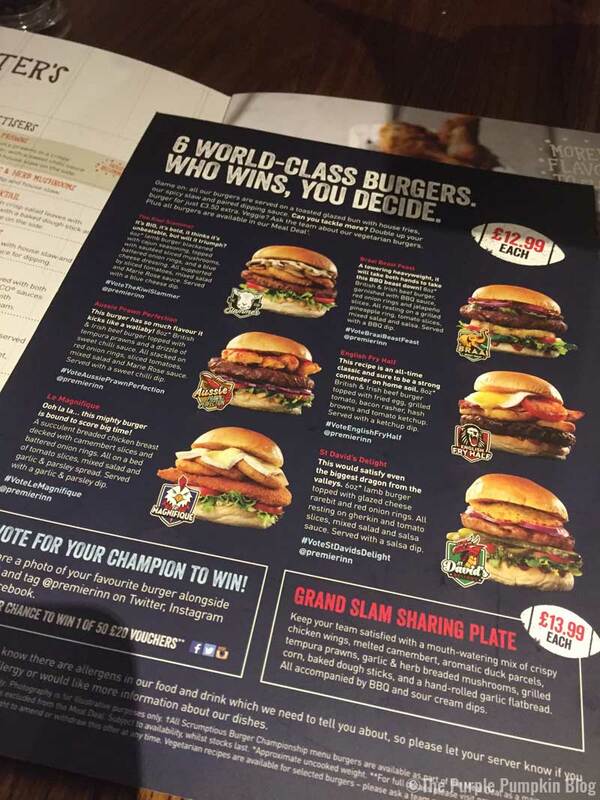 We all shared the Grand Slam Sharing Plate, which the two photos below show. The platter contained chicken wings, melted Camembert, aromatic duck parcels, tempura prawns, garlic & herb breaded mushrooms, grilled corn, baked dough sticks, and a hand-rolled garlic flatbread. All accompanied by BBQ and sour cream dips. On this special menu, it was cheaper than on the main menu, and had extra items too. A good spot by Steve, as we were going to have the other sharing platter. It was just the right size for us all to share; the aromatic duck parcels were particularly tasty. As I already said, we all had a burger for our main course. All burgers were served with chips and a spicy slaw. The slaw portion was hilariously small, more like a garnish than a side! The burgers though, were all very good. 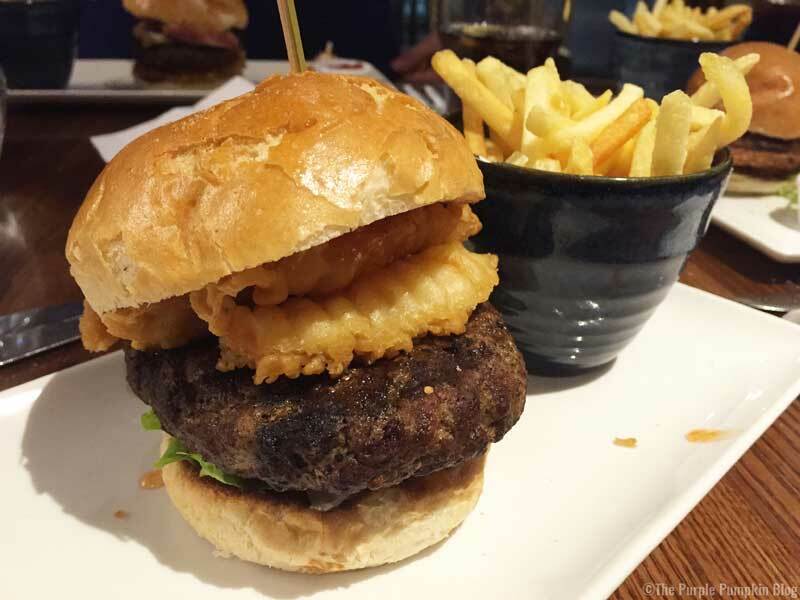 I had the Aussie Prawn Perfection – 8oz British & Irish beef burger topped with tempura prawns and a drizzle of sweet chilli sauce. All stacked on red onion rings, sliced tomatoes, mixed salad and Marie Rose sauce. Served with a sweet chilli dip. 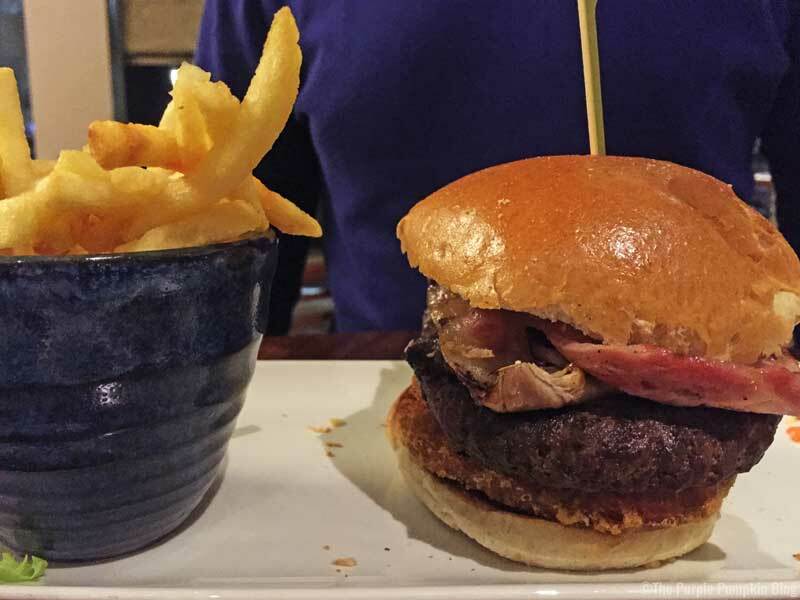 Steve had the St. David’s Delight – 6oz lamb burger topped with glazed cheese rarebit and red onions rings. All resting on gherkin and tomato slices, mixed salad and salsa sauce. Served with a salsa dip. Liam had the English Fry Half – 8oz British & Irish beef burger topped with fried egg, grilled tomato, bacon rasher, hash browns and tomato ketchup. Served with a ketchup dip. He doesn’t like egg or tomatoes, so he asked for them to be left off. By now, time was pressing on. We were getting even more tired. The service had been slow all the way through, and we just wanted to go back to our room and chill. I asked if we could take the dessert back with us, which was fine. Liam didn’t have a pud, so it was just ones for Steve and I as they were included in our meal. 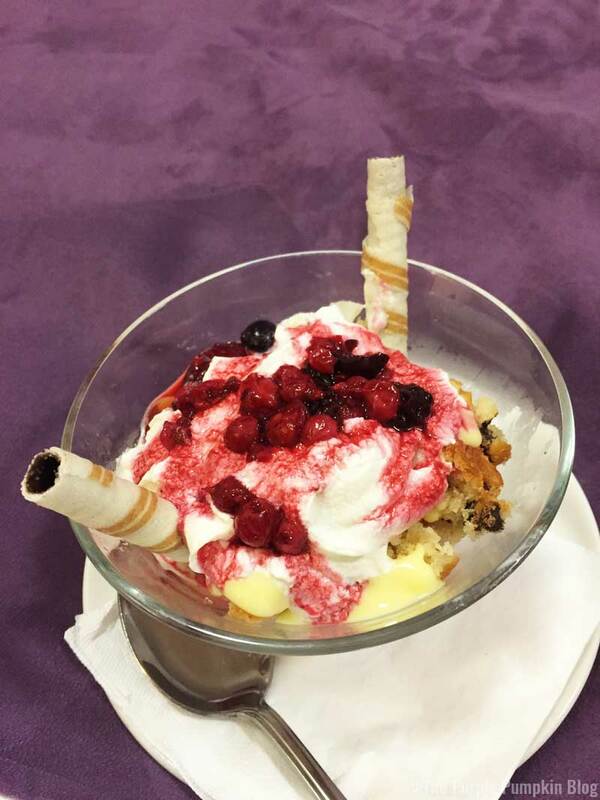 I can’t remember what we had now, some sort of trifle I believe. 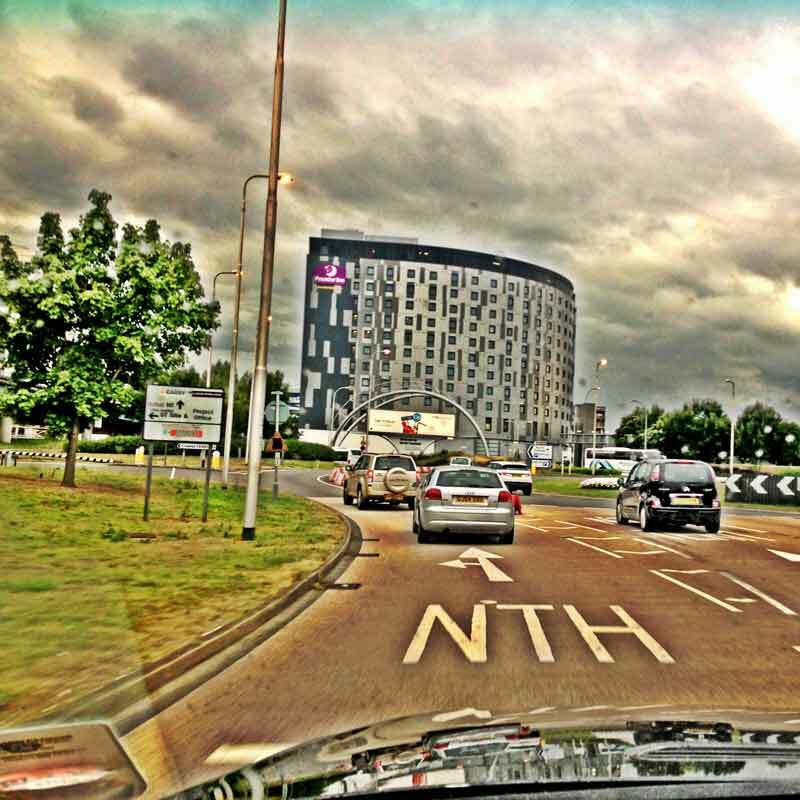 I only have this one picture…. We watched some crap on the telly before getting ready for bed, hoping to be fresh as a daisy for our flight to Orlando in the morning!